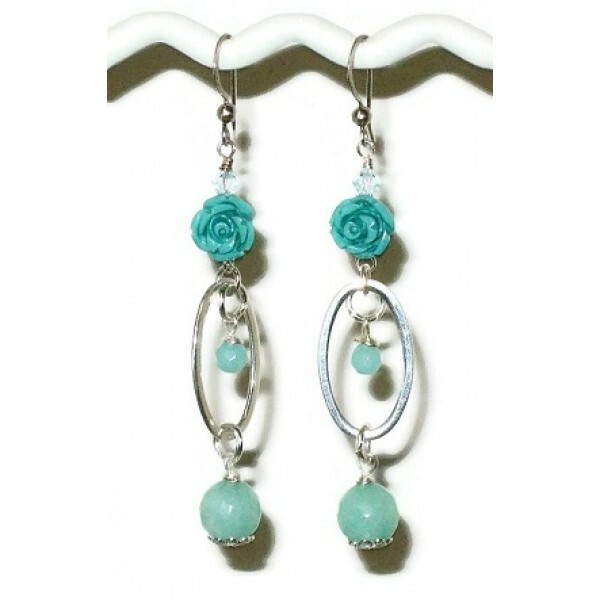 Dress up your outfit with these aqua and mint green earrings. They have semi-precious carved flowers that are linked to sterling silver ovals and adorned with Swarovski crystals, and faceted jade beads. 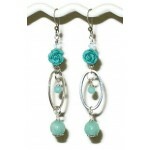 They hang on sterling silver earwires and the total length of the earrings are 2 1/2 inches. These hot pink earrings can be a good addition to your spring jewelry collection. They featu.. This aqua ring consists of three carved semi-precious flowers wrapped with non-tarnish silver-plated.. These earrings can give you a little splash of color and a stylish look. They features carved.. This faceted aqua jade wire-wrapped ring was made with non-tarnish silver-plated wire. It is i..